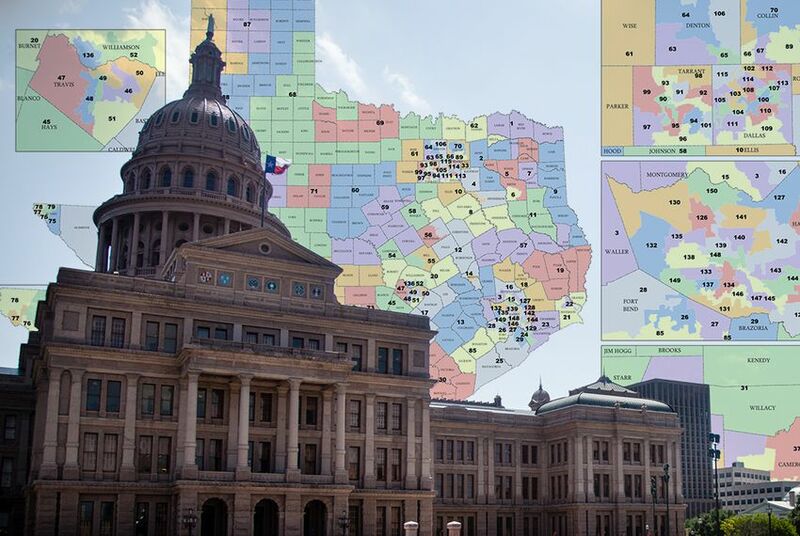 After ruling that Texas lawmakers intentionally discriminated against minorities in drawing the state's congressional map, a three-judge panel has also found fault with the state's House map. Texas lawmakers intentionally diluted the political clout of minority voters in drawing the state's House districts, a panel of federal judges ruled Thursday. In a long-awaited ruling, the San Antonio-based panel found that lawmakers in 2011 either violated the U.S. Constitution or the Voting Rights Act by intentionally diluting the strength of minority voters statewide and specifically in a litany of House districts across Texas. Those districts encompass areas including El Paso, Bexar, Nueces, Harris, Dallas and Bell counties. The court also sided with plaintiffs on the issue of improper racial gerrymandering in Bexar County and violations of the one person, one vote rule — which requires districts to be drawn with roughly equal populations — in the drawing of nine House districts in Nueces, Hidalgo, Bell and Lampasas counties. The 2-1 ruling came one month after the same court found intentional discrimination in the drawing of three Texas congressional districts. Like that ruling, however, the judges did not offer a remedy for the violations — leaving open the question of how the ruling will affect House races in 2018. Last week, a Corpus Christi-based judge again found intentional discrimination in the state’s 2011 voter ID law. In a dissenting opinion, Judge Jerry Smith of the U.S. 5th Circuit Court of Appeals called the majority’s findings “fatally infected, from start to finish, with the misunderstanding that race, rather than partisan advantage," was behind the state maps. In a statement, the Texas attorney general's office said it respectfully disagreed with the ruling. Thursday's ruling hit in the final stretch of the 2017 legislative session, scheduled to wrap up at the end of May. But because the court did not immediately order that a new map be drawn, it is unclear whether lawmakers will be forced to take action before they leave Austin. And it follows a March ruling that found lawmakers intentionally discriminated in drawing three of the state’s 36 congressional districts. The courts have already settled squabbles over the state Senate map. The state’s Republican-controlled Legislature has proved reluctant to discuss such issues. The House Committee on Redistricting, for instance, has not met since 2013 — despite calls from Democrats on the panel to discuss the March ruling and hold hearings on seven redistricting-related bills that have been referred to the committee. The committee’s chairwoman, Rep. Cindy Burkett, R-Sunnyvale, has refused to say whether she will call a hearing. “We’re just monitoring" the court proceedings, Burkett told The Texas Tribune this month, noting the lack of direction from the court. House Speaker Joe Straus’ office — which oversaw the 2011 map-drawing — did not immediately respond to a request for comment on the ruling. Meanwhile, the Democrats who challenged the statehouse map in court celebrated Thursday’s ruling as a vindication for communities of color in the state. Attorneys in the redistricting battle are scheduled to return to court on April 27 for a status conference on the congressional case. They will debate several issues, including a timeline and roadmap for any fixes the courts require. The federal judges who said the state's congressional maps are invalid last month are in position to take another step — to require Texas to get federal permission whenever it wants to change election and voting laws. Here's what you need to know about last month's huge — and incredibly complicated — ruling that effectively invalidated Texas' congressional map.